I can happily say that we had some great food at some of these restaurants. We also had some food that we didn’t think was quite worthy of the event. We had great service at some places, and service at some that will ensure we will never return. Lastly, we received some wonderful surprises, and some disheartening disappointments. The first place we went to was Wolfgang Puck which is located within the MGM Casino. This place seemed like it would be one of the “middle of the road” places but ended up being our second favorite. The restaurant is located on the outskirts of the gambling floor. Due to some windows in the wall separating the dining area from the floor, the casino lights were visible from where we were eating. This was probably the only thing which detracted from the atmosphere for me. However, the slot machine lights strobing in my face was enough for me to say the atmosphere could have improved. For the starter, Erin had the English Pea Ravioli and I had the Spring Asparagus Soup. The soup was very tasty and I would try it again anytime. For the entree, Erin had the Sautéed Salmon and I had the Grilled Rib Eye steak. In both the appetizer and the entree, the proportions were very big. So much in fact that I wasn’t able to eat any of what I’m told was a very tasty cheese cake dessert. The service was very good and attentive as well. In addition, they had a pretty decent bottled beer selection. If any of this sounds good to you, you don’t have to wait until the next DRW. Wolfgang Puck offers a Prixe Fixe menu. This is basically the same thing as what you get with DRW: a multi-course meal at a preset price. Wolfgang Puck’s Prixe Fixe is priced only slightly more than the DRW price so if you’re looking for a great way to spend a nice night out at not completely ridiculous prices (remember you are getting three courses), try it out! Iridescence at Motor City Casino was the next restaurant we visited. A few weeks before DRW, I received a phone call from one of the managers at Iridescence saying that while OpenTable (the site that I made the reservations through) had booked us on Monday, they weren’t open on Mondays. If we were willing to move our reservations to Tuesday, they would happily pick up the bill. This was before he knew if we were even going for DRW. He could have potentially been offering to pay for a $200 meal. Being flexible, we moved the reservation. To say we were happy with Iridescence would be an understatement. First off, after sitting down, we were greeted by an amuse-bouche. This is basically a complimentary single bite hors d’oeurve that is meant to excite the taste buds and get you ready for the meal. This made us, and I’m sure the other DRW diners, feel like Iridescence truly cared about making their guests dining experience feel special. Erin and I both ordered the Jumbo Lump Crab Cake for the starter. Expecting a single cake, we were quite surprised when we were greeted by plates with three decent sized crab cakes. In addition, they were well prepared and very tasty cakes. For the appetizer, I had the roasted breast of chicken while Erin tried the Potato-Truffle ravioli. The chicken was moist and very well seasoned. The ravioli was equally tasty. Finally the dessert was a Berry Yogurt Cream cake with sorbet. While not as good as the cheesecake at Wolfgang Puck, it was pretty tasty. Throughout this whole time, we were receiving exceptional service. Especially exceptional when the waiter knew we weren’t actually paying for our meal. While in the center of the dining room and not very close to the windows, we could still easily see the great views of the skyline of Detroit and into Windsor. One other nice feature of Iridescence was their wine room. Instead of just racks, it looked like their wine was on some giant mechanism made out of gears or bike chains. Like Wolfgang Puck, they also offered Prixe Fixe menus (I think they offered both a 3 and 5 course menu). Overall, Erin and I both agreed that we would return to Iridescence again. In fact, this was clearly the star of the restaurants we visited during Detroit Restaurant Week. Sadly, things start going downhill quickly after that. We next visited Rattlesnake Club. After hearing several things from other people about RC, I was very excited to try it out. The menu had both prime rib and lobster in the entrees. How could you not be excited? Things started well when we entered, as the hosts were very friendly. They put us in a spot by the windows, which initially was great, until we realized that they probably weren’t running their heat and it was cold outside. The starters were nothing special. Both Erin’s Caesar salad and my Calamari and Rock Shrimp parfait were disappointing in fact. Neither of them seemed to taste or have the quality outside something one could get at a local bar. For the entree, I had the prime rib and Erin had the lobster. After hearing so much about the quality of beef at RC, I wasn’t disappointed. The prime rib was fantastic and the horseradish to go with it was fantastic. The smashed potatoes that came with it though, despite being “roasted garlic”, seemed to lack flavor. Erin’s lobster and risotto seemed to be without flavor. Finally, neither of the desserts seemed very good. The service seemed to start well enough at RC but went downhill around the time our entrees came out. Our waitress never actually returned after we received our entrees to see how things were or to see if we needed more drinks (which we did, and never got to order). In addition, there were servers wandering around serving food to other tables not really aware of where they were supposed to be serving. All in all, what we were hoping would be great, was quite disappointing. Next, we visited Coach Insignia on the 72nd floor of the GM Renaissance Center. Again, we had high hopes for CI. Unfortunately, either they booked far too many reservations or they just can’t handle the sort of customer load they should be able to. After being sat, we waited almost 10 minutes for someone to even stop by to talk to us. At this time our waiter, who did prove to be a nice guy, took our drink orders. We then waited an additional 10 minutes for him to bring us those drinks. We then waited another 10 minutes for him to bring us bread and take our food orders (note: 30 minutes had elapsed by now). Luckily, we did have a beautiful view of Belle Isle and WIndsor. While they did seem busy, there were open tables and the floor manager was repeatedly walking the floor (and not checking tables to see how they were doing). This ended up being a theme for the night. For a starter, I had had the Chilled Poached Shrimp. This was probably the most disappointing of all the starters. There were very few shrimp and they didn’t taste very fresh. Erin had the Butternut Squash Ravioli, which was comprised of (literally) two ravioli. Things did improve with the entree (when they eventually arrived) where I had the Beef Short Ribs. They were very tender and quite good. Erin got the salmon, which was almost an exact replica of the dish at Wolfgang Puck Grille, except that it seemed to lack the freshness and flavor of that dish. After finishing our meals, our plates sat on our table for 10 minutes before I had to grab the floor manager to get them off the table. We then waited for the dessert for 10 minutes before a bus boy brought our desserts out on a tray and set them next to the table. Where they sat. After over 5 minutes, I got up and grabbed the floor manager (again) and informed him that the desserts had just sat there. You might think, “Why didn’t you just grab them and eat?” When you’re at a restaurant of that caliber, you shouldn’t have to serve yourself. The floor manager assured us he would “take care of the problem.” Shortly afterwards the waiter came over and served us our dessert. He also apologized for the delays and confided to us that he felt “embarrassed” about the way the evening was handled by the restaurant, which we actually appreciated. Finally, 10 minutes later, the manager came back over with our bill and told us that due to the poor service, he had taken 2 rounds of drink off the bill. While this was a good step towards fixing the problem, I would have expected to not have such serious issues from such a supposedly wonderful restaurant. The last restaurant we visited was SaltWater which was also on the floor of MGM Casino. I was very excited about SaltWater since I hadn’t found a good place for oysters in Detroit yet and they served fresh ones. Brad and Lisa joined us at SaltWater as they were in the mood for a fancy meal. After sitting down, it was apparent that the atmosphere was much better than what WolfGang puck offered. We seemed to be in an actual restaurant and not somewhere inside of a Casino. The waiter took our drink orders and then took about 10 minutes to deliver them. After that he was fairly quick with everything else but the bills. The bread at SaltWater is baked fresh and quite delicious. To start, I ordered a half dozen oysters. Happily, while not cheap, the oysters at SaltWater proved to be very good. We all ordered the Shrimp Cocktail for a starter except for Brad who ordered the soup. The cocktail was very good and was actually more of a martini glass with shrimp, avocado, and several sauces in it. It was close to being as good as the Crab Cakes at Iridescence. For an entree, most of us had the Swordfish while Erin tried the Bowtie Pasta. The Swordfish was fantastic and was practically a steak. In addition it was served with what had to have been the biggest asparagus I’ve ever seen. Erin’s bowtie pasta was quite tasty as well. Finally for dessert we all had the Banana Cream Pie. This was a fantastic dessert. We were actually joking about trying to tackle one of the waiters to get more. After that, the waiter brought our bills, slowly. 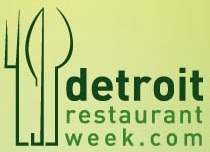 The drinks seemed to be pretty overpriced there and they added 18% gratuity to the bill automatically “because it was Detroit Restaurant Week”. While I understand that they probably get people in during DRW that might not leave a tip the waiters deserve, I think that’s a chance you have to take with DRW. Lastly, they couldn’t put the alcohol on the same bills as the DRW stuff. I don’t know what crap they feel they have to pull, but when we had just eaten at another DRW restaurant the week before across the casino floor (Wolfgang Puck) that didn’t have to do either of those things, it was pretty sad for them to say they had to. Overall it was a pretty successful DRW from our point of view. Iridescence was far and away our favorite. Wolfgang Puck came behind that, and then SaltWater. Trailing QUITE far behind were RattleSnake Club and Coach Insignia. It seems odd that the three best restaurants we tried were all in casinos and the two restaurants that were the worst (especially when it came to service) were both “historic institutions.” While I get the feeling that the people that run RattleSnake Club and Coach Insignia aren’t the sort to check up on their internet reputation, I can only hope they do, so they realize that they’ll never get repeat customers (which is the whole goal of DRW) if they don’t offer fantastic service to match what should be (hopefully) fantastic food. Once again, kudos to Iridescence. The food was wonderful, the service was excellent (and I’m not saying that because they paid for it for changing our reservation). We will definitely return in the future and will be sure to advise our friends to do the same.